Police shot and killed two people in Senegal during protests over a decision by the Constitutional Council that President Abdoulaye Wade could seek a third term, witnesses have said. A 60-year-old woman and a teenage boy died as police broke up the protests in the northern town of Podor, they say. Senegal's constitution has a two-term limit but officials ruled this does not include Mr Wade's first term, which began before the clause was adopted. Elections are due on 26 February. 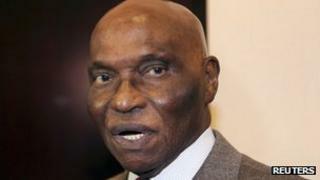 Senegal's highest court confirmed Friday's decision to allow Mr Wade, 85, to stand. The court also barred singer Youssou N'Dour and two other opposition candidates from standing. Opposition parties and activists have called for "national resistance" against Mr Wade's bid. An eyewitness in Podor told Amnesty International that the police opened fire on the demonstration. "We were walking peacefully when suddenly security forces dressed in blue and belonging to the gendarmerie fired at the marchers with live bullets. People fell in front of me," the witness said. Mr Wade was first elected in 2000, ending 40 years of rule by the Socialist Party.